The Pabisa Bali Hotel is centrally located and offers a good selection of facilities for all the family. 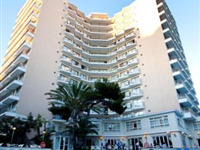 The complex is located in the heart of Playa de Palma. In the centre there is a variety of shops, bars and restaurants for all to enjoy. the beach is approx 300 metres away with loungers and parasols to hire. Palma de Mallorca Airport is approx 6 km from Playa de Palma. Pabisa Bali Hotel comprises of 264 rooms spread over 13 floors. All rooms are equipped with bathroom with bath/shower, WC, satellite TV, telephone, safety deposit box hire, air conditioning and a balcony or terrace. Facilities available to guests include 24 hour reception, money exchange, laundry facilities, games room, Wi-FI and internet access, swimming pool, loungers, parasols, sun terrace, indoor swimming pool and a childrens play area.